This book is also available in paperback. Go to learnpythonquickly.com to find out more. With this remarkable and innovative book, John Rowland has utilised the full power of eBook design. Whilst able to be read on an ordinary Kindle, the book is specifically designed to be used on the reader's computer with any of the free-to-download Kindle Reading Apps. The real power of the book lies in its extensive use of internal hyperlinks to the book's comprehensive glossary coupled with in-text external hyperlinks to official Python web sites and the book's companion web site learnpythonquickly.com, thus extending the breadth and depth of knowledge accessible to the reader. The book is suitable for those new to computing or new to Python who need to build their knowledge step by step, but the hyperlinked design also caters for readers with more computing experience. Interfacing to spreadsheets and querying databases. It then moves on to the coverage of classes and Object-Oriented Programming, with the final three chapters providing an easy-to-follow guide to multi-window Graphical User Interfaces. The book is peppered with code examples and programming exercises, the answers to which are provided as complete programs not only in the book itself but on the companion web site. This overcomes the problem of not being able to copy text from a Kindle book. The code can be freely copied from the web site and immediately run on the reader's computer. As a teacher and IT trainer with over thirty years experience, John has developed an easy writing style. This is reflected in one reviewer's comment, "John Rowland's guide gave me a sense of reassurance, as though being led into it by one who remembers how confusing a new language can be to a beginner. If I were intending learning Python, I do actually feel that I would need to begin with his guide". 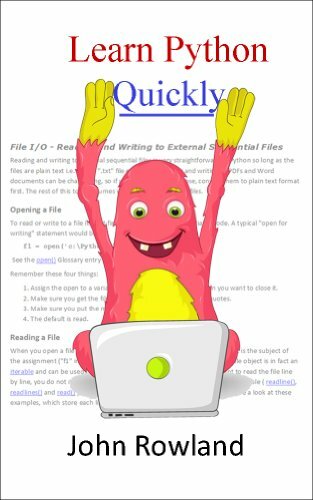 Please visit learnpythonquickly.com to find out more about the book, see some sample chapters, an extract from the glossary, and all the programs used in the book.